"The Forty-Five" redirects here. For the bodyguard of Henry III and Henry IV of France, see The forty-five guards. The Jacobite rising of 1745, also known as the Forty-five Rebellion or simply the '45 (Scottish Gaelic: Bliadhna Theàrlaich [ˈpliən̪ˠə ˈhjaːrˠl̪ˠɪç], "The Year of Charles"), was an attempt by Charles Edward Stuart to regain the British throne for his father, James Francis Edward Stuart. It took place during the War of the Austrian Succession, when the bulk of the British Army was fighting in mainland Europe, and proved to be the last in a series of revolts that began in 1689, with major outbreaks in 1708, 1715 and 1719. Charles launched the rebellion on 19 August 1745 at Glenfinnan in the Scottish Highlands, capturing Edinburgh and winning the Battle of Prestonpans in September. At a council in October, the Scots agreed to invade England after Charles assured them of substantial support from English Jacobites and a simultaneous French landing in Southern England. On that basis, the Jacobite army entered England in early November, reaching Derby on 4 December, where they decided to turn back. Similar discussions had taken place at Carlisle, Preston and Manchester and many felt they had gone too far already. The invasion route had been selected to cross areas considered strongly Jacobite but the promised English support failed to materialise; they were now outnumbered and in danger of having their retreat cut off. The decision was supported by the vast majority but caused an irretrievable split between Charles and his Scots supporters. 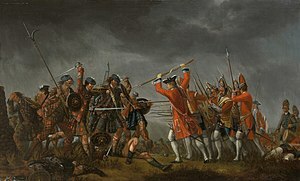 Despite victory at Falkirk Muir in January 1746, the Battle of Culloden in April ended the Rebellion and significant backing for the Stuart cause. Charles escaped to France, but was unable to win support for another attempt, and died in Rome in 1788. The 1688 Glorious Revolution replaced James II and VII with his Protestant daughter Mary and her Dutch husband William, who ruled as joint monarchs of England, Ireland and Scotland. Neither Mary, who died in 1694, nor her sister Anne, had surviving children, which left their Catholic half-brother James Francis Edward as the closest natural heir. To ensure a Protestant monarch, the 1701 Act of Settlement excluded Catholics from the succession and when Anne became queen in 1702, her heir was the distantly related but Protestant Sophia of Hanover. Sophia died in June 1714 and when Anne followed two months later in August, her son succeeded as George I.
Louis XIV of France, who had been the Stuarts' main backer, died in 1715 and his successors needed peace with Britain in order to rebuild their economy. The 1716 Anglo-French alliance forced James to leave France; he settled in Rome on a Papal pension, making him even less attractive to the Protestants who formed the vast majority of his British support. Rebellions in 1715 and 1719 failed, the latter so badly its planners concluded that it might "ruin the King's Interest and faithful subjects in these parts." Senior exiles like Bolingbroke now accepted pardons and returned home or took employment elsewhere and while many remained sympathetic, the Stuart cause seemed at an end. The birth of his sons Charles and Henry helped maintain public interest but by 1737, James was "living tranquilly in Rome, having abandoned all hope of a restoration." In the 1730s, French statesmen began to see the post-1713 expansion of British commercial strength as a threat to the European balance of power and looked for ways to reduce it. A Stuart restoration would be expensive, risky and of little value, since they were unlikely to be any more pro-French than the Hanoverians. [a] A low level, ongoing insurgency was far more cost-effective and the Scottish Highlands an ideal location, due to the feudal nature of clan society, their remoteness and terrain; but as many Scottish Jacobites recognised, they could also be devastating for the local populace. Trade disputes between Spain and Britain led to the 1739 War of Jenkins' Ear, followed in 1740–41 by the War of the Austrian Succession. The long-serving British prime minister Robert Walpole was forced to resign in February 1742 by an alliance of Tories and anti-Walpole Patriot Whigs, who then did a deal that excluded the majority of their Tory partners from government. Furious Tories such as the Duke of Beaufort now asked for French help in restoring James to the British throne. While war with Britain was clearly only a matter of time, Cardinal Fleury, chief minister since 1723, viewed the Jacobites as unreliable fantasists, an opinion shared by most French ministers. One exception was the Marquis D'Argenson; when Fleury died in January 1743, Louis XV took control of government and appointed him foreign minister in November 1744. In 1745, supporters of the exiled Stuarts, or Jacobites, remained a significant element in British and Irish politics but with different and often competing goals. These divisions, especially between the Scots and Irish, became increasingly apparent during the 1745 Rising, which also demonstrated estimates of English support confused indifference to the Hanoverians with enthusiasm for the Stuarts. Charles' senior advisors included Irish exiles such as John O'Sullivan, who wanted an autonomous, Catholic Ireland and the return of lands confiscated after the Irish Confederate Wars. James II promised these concessions in return for Irish support in the 1689–91 Williamite War, and only a Stuart on the throne of Great Britain could ensure their fulfilment. Sir Watkin Williams-Wynn (1692–1749), Welsh landowner and Member of Parliament; the sky-blue waistcoat worn here was a symbol used by Tory Jacobites. A prominent factor in Tory opposition to the Hanoverians was their preference for a mercantilist strategy, which emphasised the protection of British trade. This meant focusing expenditure on strengthening the Royal Navy, with European land commitments seen as expensive and primarily of benefit to Hanover. This view was particularly strong in the City of London but diplomats observed opposition to foreign entanglements was true "only so long as English commerce does not suffer". While a large proportion of English participants in the 1715 Rising were Catholic, the majority of English and Welsh Tories sympathetic to the Stuarts were fervently anti-Catholic. The Protestant Thomas Forster was appointed commander of English Jacobite forces in 1715 despite his lack of military experience, simply to avoid the perception of the Rising as a Catholic revolt. In 1745, many Tories remained supportive of the Stuart cause but were far more concerned by a perceived need to ensure the primacy of the Church of England. That included defending it from Charles and his Catholic advisors, the Scots Presbyterians who formed the bulk of his army or Nonconformists in general; many "Jacobite" demonstrations in Wales stemmed from hostility to the 18th century Welsh Methodist revival. The Jacobite exiles failed to appreciate these distinctions or the extent to which Tory support derived from policy differences with the Whigs, not Stuart loyalism. The most prominent Welsh Jacobite was Denbighshire landowner and Tory Member of Parliament, Sir Watkin Williams-Wynn, head of the Jacobite White Rose society. He met with Stuart agents several times between 1740 and 1744 and promised support "if the Prince brought a French army"; in the end, he spent the Rebellion in London, with participation by the Welsh gentry limited to two lawyers, David Morgan and William Vaughan. After the failed 1719 Rising, new laws in Scotland and England imposed penalties on nonjuring clergy, those who refused to swear allegiance to the Hanoverian regime, rather than the Stuarts. The main issue in England was whether it was permissible to switch allegiance and so the problem naturally diminished as these priests died. In Scotland, they preserved their independence due to doctrinal differences with the majority Church of Scotland, which continues today in the Scottish Episcopal Church; many of the Rebellion's leaders and participants were members of non-juring Episcopalian congregations. However, the strongest single element of Scottish Jacobite support in 1745 was opposition to the 1707 Union, where loss of political control was not matched by perceived economic benefit; this was particularly marked in Edinburgh, former location of the Scottish Parliament, and the Highlands. In summary, Charles wanted to reclaim the throne of a united Great Britain and rule on the principles of the divine right of kings and absolutism, ideas rejected by the 1688 Glorious Revolution but which were reinforced by his trusted advisors, most of whom were long-term English or Irish Catholic exiles. [b] They differed sharply from the Scottish Protestant nationalists that comprised the bulk of Jacobite support in 1745, who opposed the Union, Catholicism and "arbitrary" rule. In the 1743 Treaty of Fontainebleau or Pacte de Famille, Louis and his uncle, Philip V of Spain, agreed to co-operate against Britain, including an attempted restoration of the Stuarts. In November, Louis advised James the invasion was planned for February and began assembling 12,000 troops and transports at Dunkirk, selected because it was possible to reach the Thames from there in a single tide. Since the Royal Navy was well aware of this, the French squadron in Brest made ostentatious preparations for putting to sea, in hopes of luring their patrols away. James remained in Rome while Charles made his way in secret to join the invasion force but when the French admiral Roquefeuil's squadron left Brest on 26 January, the Royal Navy refused to follow. Naval operations against Britain often took place in the winter, when wind and tides made it harder to enforce a blockade but increased the risks. As in 1719, the weather proved the British government's best defence; storms sank a number of French ships and severely damaged many others, Roquefeuil himself being among the casualties. In March, Louis cancelled the invasion and declared war on Britain. In August, Charles travelled to Paris to argue for an alternative landing in Scotland, where he met with Sir John Murray of Broughton, liaison between the Stuarts and their Scottish supporters. Murray later claimed he advised against it but Charles was "determined to come [...] though with a single footman". When Murray returned with this news, the Scots reiterated their opposition to a rising without substantial French backing but Charles gambled once there, the French would have to support him. He spent the first months of 1745 purchasing weapons, while victory at Fontenoy in April encouraged the French authorities to provide him with two transport ships. These were the 16-gun privateer Du Teillay and Elizabeth, an elderly 64-gun warship captured from the British in 1704, which carried the weapons and around 100 volunteers from the French Army's Irish Brigade. In early July, Charles boarded Du Teillay at Saint-Nazaire accompanied by the "Seven Men of Moidart", the most notable being John O'Sullivan, an Irish exile and former French officer who acted as chief of staff. The two vessels left for the Western Isles on 15 July but were intercepted four days out by HMS Lion, which engaged Elizabeth. After a four hour battle, both were forced to return to port; loss of the volunteers and weapons on Elizabeth was a major setback but Du Teillay landed Charles at Eriskay on 23 July. Many of those contacted advised him to return to France, including MacDonald of Sleat and Norman MacLeod. Aware of the potential impact of defeat, they felt that by arriving without French military support, Charles had failed to keep his commitments and were unconvinced by his personal qualities. It is also suggested Sleat and Macloed were especially vulnerable to government sanctions due to their involvement in illegally selling tenants into indentured servitude. Enough were persuaded but the choice was rarely simple; Donald Cameron of Lochiel committed only after Charles provided "security for the full value of his estate should the rising prove abortive," while MacLeod and Sleat helped him escape after Culloden. 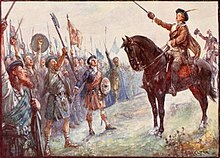 On 19 August, the rebellion was launched with the raising of the Royal Standard at Glenfinnan, witnessed by a force of Highlanders O'Sullivan estimated as around 700. The Jacobites marched on Edinburgh, reaching Perth on 4 September where they were joined by more sympathisers, including Lord George Murray. Previously pardoned for his participation in the 1715 and 1719 risings, Murray took over from O'Sullivan due to his better understanding of Highland military customs and the Jacobites spent the next week re-organising their forces. The senior government legal officer in Scotland, Lord President Duncan Forbes, forwarded confirmation of the landing to London on 9 August. Many of the 3,000 soldiers available to Sir John Cope were untrained recruits and while he lacked information on Jacobite intentions, they were well-informed on his since prior to his defection, Murray was one of his advisors. Forbes instead relied on his relationships to keep people loyal; he failed with Lochiel and Lord Lovat but succeeded with many others, including the Earl of Sutherland, Clan Munro and Lord Fortrose. Duncan Forbes, Lord Culloden, the senior government legal officer in Scotland. On 17 September, Charles entered Edinburgh unopposed, although Edinburgh Castle itself remained in government hands; James was proclaimed King of Scotland the next day and Charles his Regent. On 21 September, the Jacobites intercepted and scattered Cope's army in less than 20 minutes at the Battle of Prestonpans, just outside Edinburgh. The Duke of Cumberland, commander of the British army in Flanders, was recalled to London, along with 12,000 troops. To consolidate his support in Scotland, Charles published two "Declarations" on 9 and 10 October: the first dissolved the "pretended Union," the second rejected the Act of Settlement. He also instructed the 'Caledonian Mercury' to publish minutes of the 1695 Parliamentary enquiry into the Glencoe Massacre, often used as an example of post-1688 oppression. These were highlighted by the meetings held on 30 and 31 October to discuss the invasion of England; the Scots wanted to consolidate and though willing to assist an English rising or French invasion, they would not do it on their own. For the Irish exiles, only a Stuart on the British throne could provide the autonomous, Catholic Ireland promised by James II. Charles argued removing the Hanoverians was the best guarantee of an independent Scotland and thousands of supporters would join once they entered England, while the Marquis d’Éguilles assured the Council a French landing in England was imminent. Despite their doubts, the Council agreed to the invasion, on condition the promised English and French support was forthcoming. [d] Previous Scottish incursions into England had crossed the border at Berwick-upon-Tweed, but Murray selected a route via Carlisle and the North-West of England, areas strongly Jacobite in 1715. 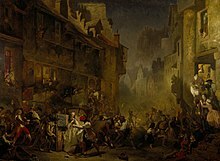 The last elements of the Jacobite army left Edinburgh on 4 November and government forces under General Handasyde retook the city on 14th. Murray divided the army into two columns to conceal their destination from General Wade, government commander in Newcastle, and entered England on 8 November without opposition. On 10th, they reached Carlisle, an important border fortress before the 1707 Union but whose defences were now in poor condition, held by a garrison of 80 elderly veterans. Despite this, without siege artillery the Jacobites would have to starve it into submission, an operation for which they had neither the equipment or time. The castle capitulated on 15 November, after learning Wade's relief force was delayed by snow; Cumberland wanted to execute those responsible when he retook the city in December. Leaving a small garrison, the Jacobites continued south to Preston on 26 November, then Manchester on 28th, where they received the first notable intake of English recruits. These were formed into the Manchester Regiment, commanded by Francis Towneley, a Lancashire Catholic; he previously served as an officer in the French Army and his elder brother Richard narrowly escaped execution for his part in the 1715 Rising. The army entered Derby on 4 December and the Council convened on 5th to discuss their next steps. There was no sign of a French landing in England, and despite the large crowds that turned out to see them on the march south, only Manchester provided a significant number of recruits; Preston, a Jacobite stronghold in 1715, supplied three. At Council meetings in Preston and Manchester, many Scots felt they had gone far enough and agreed to continue onto Derby only when Charles claimed Sir Watkin Williams Wynn would meet them there and that the Duke of Beaufort was preparing to seize the strategic port of Bristol. Murray argued they had gone as far as possible and now risked being cut off by superior forces, with Cumberland advancing north from London and Wade moving south from Newcastle. When Charles was asked for news of Sir Watkin and Beaufort, he admitted he had not heard from the English Jacobites since leaving France; this meant he lied when claiming otherwise and his relationship with the Scots was irretrievably damaged. The view they should consolidate their position in Scotland were reinforced by news that Scots and Irish regulars from the Royal Écossais and the Irish Brigade had been landed at Montrose, with large quantities of weapons, ammunition and money. The Council was overwhelmingly in favour of retreat and turned north the next day. While this has been debated ever since, contemporaries did not believe the Hanoverian regime would collapse, even if the Jacobites reached London. Their decision was driven by lack of English or French support, not proximity to the capital and its wisdom is supported by many modern historians. The chief advantage for the lightly-equipped Jacobite army was speed of movement but the lack of heavy weapons was a disadvantage if they had to fight. In a letter of 30 November the Duke of Richmond, who was with Cumberland's army, listed five possible options for the Jacobites, of which retreating to Scotland was by far the best for them and the worst for the government. The British government was concerned by reports of an invasion fleet being prepared at Dunkirk but it is unclear how serious these plans were. Over the winter of 1745 to 1746, Marshall Saxe was assembling troops in Northern France in preparation for an offensive into Flanders, while Dunkirk was a major privateer base and always busy. Threatening an invasion was a far more cost-effective means of consuming British resources than actually doing so and these plans were formally cancelled in January 1746. The biggest impact was on the relationship between Charles and his Scottish supporters, especially Murray, both sides now viewing the other with deep suspicion. Elcho later wrote that Murray believed they could have continued the war in Scotland "for several years", forcing the Crown to come to terms as its troops were desperately needed for the war on the Continent. The fast-moving Jacobite army evaded pursuit with only a minor skirmish at Clifton Moor, crossing back into Scotland on 20 December. Cumberland's army arrived outside Carlisle on 22 December, and seven days later the garrison was forced to surrender, ending the Jacobite military presence in England. Much of the garrison came from the Manchester Regiment and several of the officers were later executed, including Francis Towneley. The invasion itself achieved little, but reaching Derby and returning was a considerable military achievement. Morale was high, recruits from the Frasers, Mackenzies and Gordons and reinforcement by Scottish and Irish regulars in French service bringing Jacobite strength to over 8,000. French-supplied artillery was used to besiege Stirling Castle, the strategic key to the Highlands. On 17 January, the Jacobites dispersed a relief force under Henry Hawley at the Battle of Falkirk Muir but the siege itself made little progress. Hawley's forces were largely intact and advanced on Stirling again once Cumberland arrived in Edinburgh on 30 January, while many Highlanders had gone home after Falkirk; on 1 February, the siege was abandoned and the Jacobite main force retreated to Inverness. Cumberland's army advanced along the coast, allowing it to be resupplied by sea, and entered Aberdeen on 27 February; both sides halted operations until the weather improved. A few French shipments evaded the Royal Navy's blockade but by spring, the Jacobites were short of food, money and weapons and when Cumberland left Aberdeen on 8 April, the leadership agreed giving battle was their best option. Arguments over the location stem from post-war disputes between supporters of Murray and O'Sullivan, largely responsible for selecting it, but defeat was a combination of factors. In addition to superior numbers and equipment, Cumberland's troops had been drilled in countering the Highland charge, which relied on speed and ferocity to break the enemy lines. When successful, it resulted in quick victories like Prestonpans and Falkirk. but if it failed, they could not hold their ground. The Battle of Culloden on 16 April, often cited as the last pitched battle on British soil, lasted less than an hour and ended in a decisive government victory. Exhausted by a night march carried out in a failed attempt to surprise Cumberland's troops, many Jacobites missed the battle, leaving fewer than 5,000 to face a well-rested and equipped force of 7,000 to 9,000. Fighting began with an artillery exchange, that of the government being vastly superior in numbers and training; Charles held his position, expecting Cumberland to attack but he refused to do so. Unable to respond to the fire and taking heavy casualties, some of the clan regiments began to withdraw and Charles ordered his front line to charge. As they did so, the boggy ground in front forced the Jacobite left wing over to the right (see Map), where their movement was restricted by a park wall. This increased the distance to the government lines and slowed the momentum of the charge, lengthening their exposure to the government artillery, which now switched to grapeshot. Despite this, the Highlanders crashed into Cumberland's left, which gave ground but did not break, while Loudon's regiment fired into their flank from behind the wall. Unable to return fire, the Highlanders broke and fell back in confusion; the Irish and Scots regulars in the second line retired in good order, allowing Charles and his personal retinue to escape northwards. Troops that held together, like the French regulars, were far less vulnerable in retreat and many Highlanders were cut down by government dragoons in the pursuit. Government casualties are estimated as 50 killed, plus 259 wounded; many Jacobite wounded remaining on the battlefield were reportedly killed afterwards, their losses being 1,200–1,500 dead and 500 prisoners. Over the next two days, an estimated 1,500 survivors assembled at Ruthven Barracks; on 20 April, Charles ordered them to disperse, arguing French assistance was required to continue the fight and they should return home until he returned with additional support. Lord Elcho later claimed to have told Charles he should "put himself at the head of the 9,000 men that remained to him, and live and die with them," but he was determined to leave for France. After evading capture in the Western Highlands, Charles was picked up by a French ship on 20 September; he never returned to Scotland but the collapse of his relationship with the Scots always made this unlikely. Even before Derby, he accused Murray and others of treachery; these outbursts became more frequent due to disappointment and heavy drinking, while the Scots no longer trusted his promises of support. After Culloden, government forces spent several weeks searching for rebels, confiscating cattle and burning non-juring Episcopalian and Catholic meeting houses. Regular soldiers in French service were treated as prisoners of war and later exchanged, regardless of nationality, but 3,500 captured Jacobites were indicted for treason. Of these, 120 were executed, primarily deserters and members of the Manchester Regiment, 650 died awaiting trial, 900 pardoned and the rest transported. The Jacobite lords Kilmarnock, Balmerino and Lovat were beheaded in April 1747, but public sympathies had shifted; Cumberland's insistence on severity earned him the nickname "Butcher" among Jacobite sympathisers. The 1747 Act of Indemnity pardoned any remaining prisoners, including Flora MacDonald, whose aristocratic admirers, among them Frederick, Prince of Wales, collected over £1,500 for her. Lord Elcho, Lord Murray and Lochiel died in exile; Archibald Cameron, employed by Lochiel in 1745 to force reluctant tenants into the Jacobite army, was allegedly betrayed by his own clansmen on returning to Scotland and executed on 7 June 1753. Once north of Edinburgh or inland from ports like Aberdeen, Cumberland's troops were hampered by the fact that there were few roads and no accurate maps of the Highlands. To prevent future rebellions, new forts were built, the military road network started by Wade finally completed and William Roy made the first comprehensive survey of the Highlands. Additional measures were taken to weaken the traditional clan system, which even before 1745 had been under severe stress due to changing economic conditions. The Heritable Jurisdictions Act ended powers exercised by chiefs over their clansmen, while the Act of Proscription outlawed Highland dress unless worn in military service; its impact is debated and the law was repealed in 1782. The Jacobite cause did not entirely disappear after 1746, but the exposure of the key factions' conflicting objectives ended it as a serious threat. Many Scots were disillusioned by Charles' leadership while the decline in English Jacobitism was demonstrated by the lack of support from areas that had been strongly Jacobite in 1715, such as Northumberland and County Durham. Irish Jacobite societies continued but increasingly reflected opposition to the existing order rather than affection for the Stuarts and were eventually absorbed by the Republican United Irishmen. Equally damaging to the Jacobite cause and Charles in particular was D’Éguilles' report on the Rising, written on his return to France in June 1747 and addressed to Count Maurepas, the Naval Minister. With the exception of O'Sullivan and Lochiel, this was extremely critical of the Jacobite leaders; his opinion of Charles was so low, he suggested a Scots Republic was a better option for France than a Stuart restoration. The Rebellion was the highlight of their careers for both leaders; Cumberland resigned from the Army in 1757 and died of a stroke in 1765. Charles was treated as a hero on his return to Paris but the Stuarts were once again barred from France by the 1748 Treaty of Aix-la-Chapelle. Henry Stuart's entry into the Catholic Church in June 1747 was seen as tacit acceptance the Jacobite cause was finished and Charles never forgave him. He continued attempts to reignite the cause, including a secret visit to London in 1750 and met with French Chief Minister de Choiseul in 1759 to discuss another invasion but Choiseul dismissed him as incapable through drink. Despite Henry's urgings, Pope Clement XIII refused to recognise him as Charles III after their father died in 1766. He died of a stroke in Rome in January 1788, a disappointed and embittered man. The accepted idea of the Forty-Five in the minds of most people is a hazy and picturesque combination of a picnic and a crusade ... In cold reality, Charles was unwanted and unwelcomed." Modern commentators argue the traditional focus on "Bonnie Prince Charlie" obscures the true legacy of the Rising and that since nationalism was a key driver for many Scottish Jacobites, it is part of an ongoing political idea, not simply the last act of a doomed cause and culture. The Jacobite Army is often portrayed as largely composed of Gaelic-speaking Highlanders; in 2013, the Culloden Visitors Centre listed Lowland regiments such as Lord Elcho's and Balmerino's Life Guards, Baggot's Hussars and Viscount Strathallan's Perthshire Horse as "Highland Horse". Although a significant proportion were Highlanders, some of the most effective units came from the Lowlands, while this predominantly Scottish force included the English Manchester Regiment, as well as French and Irish regulars. After 1745, the popular perception of Highlanders changed from that of "wyld, wykkd Helandmen," racially and culturally separate from other Scots, to members of a noble warrior race. For a century before 1745, rural poverty drove increasing numbers to enlist in foreign armies, such as the Dutch Scots Brigade. However, while military experience itself was common, the military aspects of clanship had been in decline for many years, the last significant inter-clan battle being Maol Ruadh in August 1688. Foreign service was banned in 1745 and recruitment into the British Army accelerated as deliberate policy. Victorian imperial administrators adopted a policy of focusing their recruitment on the so-called "martial races," Highlanders being grouped with Sikhs, Dogras and Gurkhas as those arbitrarily identified as sharing military virtues. Before 1707, Scots writers formed part of a wider and often uniform European literary culture; the creation of a uniquely Scottish style began as a reaction to Union, with poets like Allan Ramsay using Scots vernacular for the first time. After the Rising, reconciling the Jacobite past with a Unionist present meant focusing on a shared cultural identity, which was made easier by the fact it did not imply sympathy for the Stuarts; Ramsay was one of those who left Edinburgh when it fell to the Jacobites in 1745. However, the study of Scottish history itself was largely ignored by schools and universities until the mid-20th century. The vernacular style was continued after 1745, most famously by Robert Burns but others avoided recent divisions within Scottish society by looking back to a far more distant and largely mythical past. These included James Macpherson, who between 1760 and 1765 published the Ossian cycle which was a best-seller throughout Europe. The claim that it was a translation from the original Gaelic has been disputed ever since but the post-1746 sense of a culture under threat led to an upsurge in Scottish Gaelic literature, much of it related to the events of the Rising. Alasdair mac Mhaighstir Alasdair, generally credited as author of the first secular works in Gaelic in the early 1740s, was followed by Gaelic poets including Donnchadh Bàn Mac an t-Saoir, who participated in the Rising as part of a government militia, and Catriona Nic Fhearghais, who allegedly lost her husband at Culloden. The Rising and its aftermath has been a popular topic for many writers; the most significant of these was Sir Walter Scott, who in the early 19th century presented the Rebellion as part of a shared Unionist history. The hero of his novel Waverley is an Englishman who fights for the Stuarts, rescues a Hanoverian Colonel and finally rejects a romantic Highland beauty for the daughter of a Lowland aristocrat. 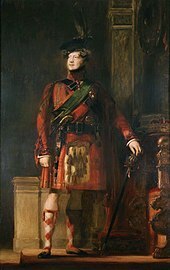 Scott's reconciliation of Unionism and the '45 allowed Cumberland's nephew George IV to be painted less than 70 years later wearing Highland dress and tartans, previously symbols of Jacobite rebellion. Replacing a complex and divisive historical past with a simplified but shared cultural tradition led to the Victorian inventions of Burns Suppers, Highland Games, tartans and the adoption by a largely Protestant nation of the Catholic icons Mary, Queen of Scots and Bonnie Prince Charlie. These continue to shape modern perspectives on the Scots past. ^ Summarised in a British intelligence report of 1755; "...'tis not in the interest of France that the House of Stuart shoud ever be restored, as it would only unite the three Kingdoms against Them; England would have no exterior [threat] to mind, and [...] prevent any of its Descendants (the Stuarts) attempting anything against the Libertys or Religion of the People. ^ Scots made up less than five percent of the Jacobite court in 1696 and 1709: by far the largest element were English, followed by Irish and French. ^ Elcho reported that besides himself, the Council included Perth, Lord George Murray; Sheridan, Murray of Broughton, O'Sullivan, Lochiel, Keppoch, Clanranald, Glencoe, Ardsheal and Lochgarry. ^ In his Diary, Lord Elcho later wrote that "...the majority of the Council was not in favour of a march to England and urged that they should remain in Scotland to watch events and defend their own land. This was also the opinion in secret of the Marquis d’Éguilles; but the wishes of the Prince prevailed." ^ Pittock & Oxford DNB. Corp, Edward (2014). "The Scottish Jacobite Community at Saint-Germain after the Departure of the Stuart Court". In Macinnes, Allan I.; German, Kieran; Graham, Lesley (eds.). Living with Jacobitism, 1690–1788: The Three Kingdoms and Beyond. Pickering & Chatto. pp. 27–38. ISBN 978-1848934702. "The Inventory of Historic Battlefields – Battle of Culloden" (PDF). Historic Scotland. Retrieved 16 November 2018. Mearns, Alasdair B. (2007). "Catriona Nic Fhearghais (Christiana Fergusson)". In Ewan, Elizabeth; Pipes, Rose; Rendall, Jane; Reynolds, Siân (eds.). The Biographical Dictionary of Scottish Women. Edinburgh University Press. ISBN 978-0748632930. Morris, R. J. (1992). "Victorian Values in Scotland & England" (PDF). In Smout, T. C. (ed.). Victorian Values. Proceedings of the British Academy. 78. ISBN 978-0197261194. Murray, John (1898). Bell, Robert Fitzroy (ed.). Memorials of John Murray of Broughton: Sometime Secretary to Prince Charles Edward, 1740-1747. T. and A. Constable at the Edinburgh University Press for the Scottish History Society. OCLC 879747289 – via Internet Archive. Wemyss, Alice (2003). Gibson, John Sibbald (ed.). Elcho of the '45. Saltire Society. ISBN 978-0854110803.